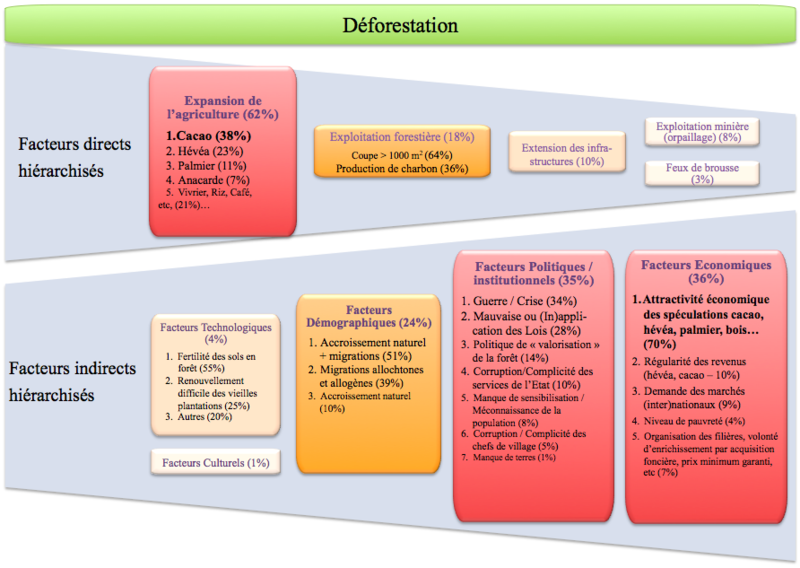 In addition to the historical deforestation mapping conducted by the BNETD (Ivorian technical office), the FAO and the permanent Executive Secretariat of REDD+ mandated Nitidæ in order to identify and quantify the direct and indirect factors of the deforestation that have reduced Ivorian forests from 7,8 to 3,4 million hectares (10.6% of the territory) from 1990 to 2015. The study also focused on the analysis of forest degradation factors, another more worrying phenomenon in Cote d'Ivoire. In the 7 Agro-Ecological Areas of Cote d'Ivoire, the analysis of the above factors has led BNETD and Nitidæ teams to consult nearly 400 people in various forms. It also allowed to identify and quantify the weight of the multiple direct and indirect factors of deforestation and degradation, at a national level and at the level of each Agro-Ecological Areas, in Cote d'Ivoire. R1. On deforestation in terms of direct factors, the analysis confirms the very important weight of the agriculture expansion (mainly cocoa farming) in the process of deforestation of the last 25 years. This phenomenon being quoted at 62 % by surveyed persons and this proportion varies between 22% for the Eastern Area and 71% for the South East Area. Next come the exploitation of wood energy (29%), the spread of bush fires (23%) and mining (3%). R2. On deforestation in terms of indirect factors, it is the categories of economic factors (36%) and political/institutional factors (35%) that are put forward by the persons surveyed. Then, comes the following category : demographic data (24%). In all categories, the first three factors cited are: Economic attractiveness of activities leading to deforestation (25%), Population growth, included migration (12.5%) and War / Political crisis (12%). R3. 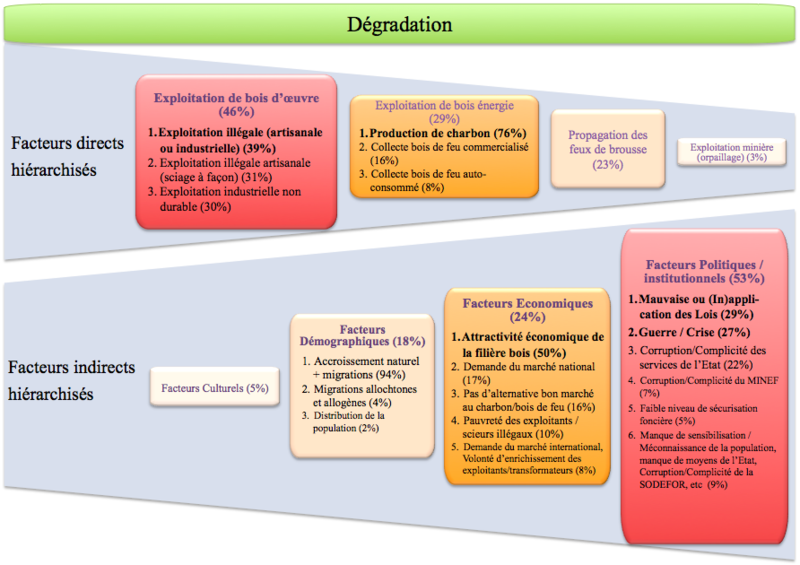 On degradation in terms of direct factors, the analysis confirms the very important weight of timber exploitation, fairly distributed between sawing and industrial exploitation. This category is quoted at 46% by the persons surveyed and this proportion varies between 21% for the North Area and 71% for the South East Area. Then come the following categories : logging (cited at 29%), bush fire spread (23%) and mining (3%). R4. On degradation in terms of indirect factors, it is important to note that the considerable weight of the category of political and institutional factors (53%), far ahead of economic (24%) or demographic factors (18%), even if the very first factor expressed in all categories is population growth, including migration (17%). The 2nd and 3rd most cited factors are: poor (or lack of) enforcement of laws and regulations (15%) and the crisis of the 2000s (14%).